I hope everyone had a wonderful and restful weekend! I can’t believe how quickly time is passing. FSA will be starting up again on May 1st. We will be taking this week to fine tune ELA skills and test-taking strategies. We are holding a clothing/item drive for our adopted community charity, One Heart for Women and Children. I would love to see our students help those in need. If you have any questions about this please do not hesitate to contact me. 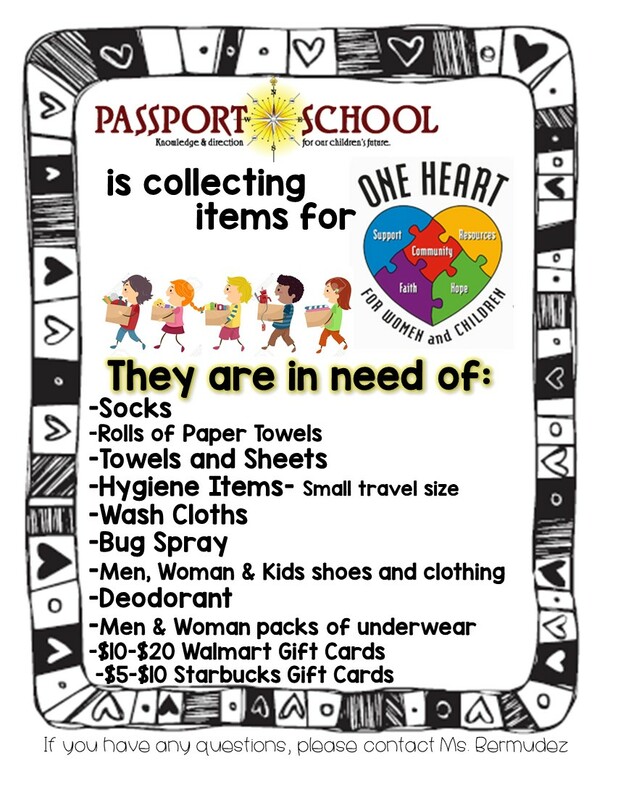 One Heart Donation Drive FlyerThese are the items in need. As we continue our journey this academic year please remember communication is the key. Please refer to this site for class assignments, homework, and spelling lists. If you need to have something clarified please do not hesitate to contact me. I appreciate all of your help. Please do not hesitate to contact me with any questions or concerns. The best way is through my school email, jscheu@passportcharter.org. Monday – Performance Coach Workbook pg 181 – 184 “Oliver Twist” Complete 1-4. Be sure to pay attention to what is being asked and add supporting details. Tuesday – Complete Spelling/Vocabulary Extra Credit and study for test. Wednesday – Performance Coach Workbook pg 285 – 286 Complete 1-4. Thursday – Performance Coach Workbook pg 38 – 42 Elements of Drama; complete 1-5. Be sure to pay attention to what is being asked. Please remember … Spelling/Vocabulary test on every other Wednesday and Reading test every Friday. Monday – pg 67 – 70 Performance Coach Workbook: Informational Articles, “Shark Tales” Complete 1-5. Be sure to pay attention to what is being asked and add elaboration. Tuesday – Spelling/Vocabulary Extra Credit and study for test. Wednesday – pg 245 – 247 Performance Coach Workbook: Functional Texts, complete 1-4. Monday – Performance Coach Workbook pg 58 – 62 complete 1-4. Be sure to pay attention to what is being asked and add elaboration. Wednesday – pg 118 – 121 Performance Coach Workbook; Scientific and Technical Texts Complete 1-4. Thursday – Study for Reading test. Please remember … Spelling/Vocabulary test on every other Wednesday and Reading test on Friday. That’s all for this week. Have a fabulous week and continue to work hard!! !